When I received his email from Canada I was a little suspicious. Steve said he was going to be in Omarama for 2 weeks and just wanted a single day out on the river. I thought to myself that here was someone who just wanted a spot to fish! In fact it turned out that Steve is related to good friends of mine down there in Omarama. Really layed back this cool dude was a pleasure to guide. We ended up going up the Tekapo for some tuition before hitting the big time a few days later. 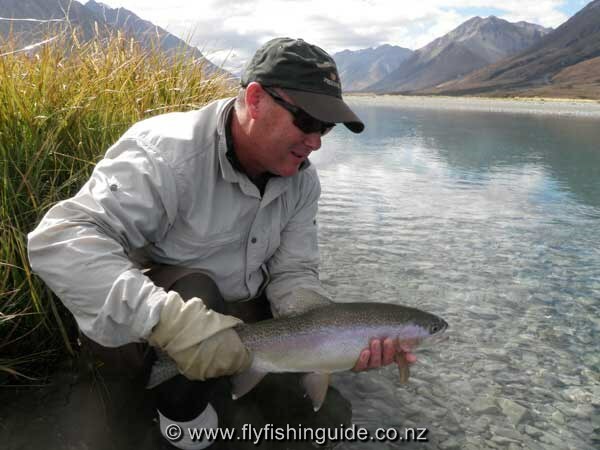 Getting a client their first decent fish, after lean pickings fishing alone, is the most rewarding aspect of guiding. There is a genuine joy that is unmistakable - a real feel good feeling! Rainbows were on the "menu" today. A late season mayfly (or should that be April fly?) hatch helped the cause.Steve won't be back for 2 or 3 years but he will be back of that I'm certain!" All good things have to end and the rivers close here on 30 April. Time for this fishing guide to hibernate for the winter and recharge the batteries for next season's opening on 6 November 2010. The smile says it all! Lovely fish in beaut surroundings. 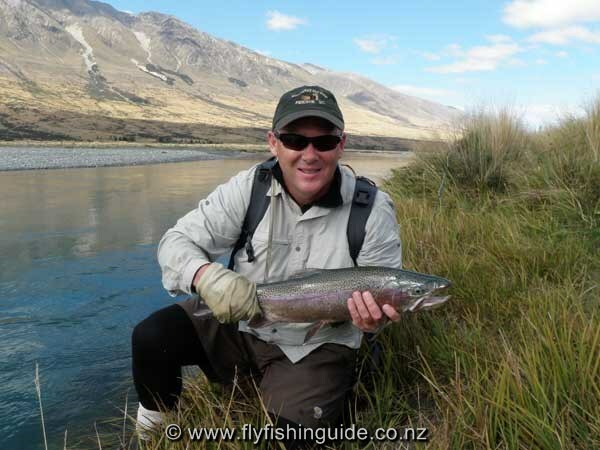 A nice high country rainbow about to go "back home".